I have participated in Modern category with the quilt "Eye Ghosting"! As I was searching for inspiration for the theme of Reflection, I came upon many different ideas – from most common mirror images to physical diffraction. The most impressive picture was the eye ghosting vision after LASIK surgery. The temporary double vision or ghosting images during the normal six-month healing period tend to be caused by an irregularity in the cornea. The ability to see is a miracle. Having myopia, I totally understand the problem of ghosting vision. 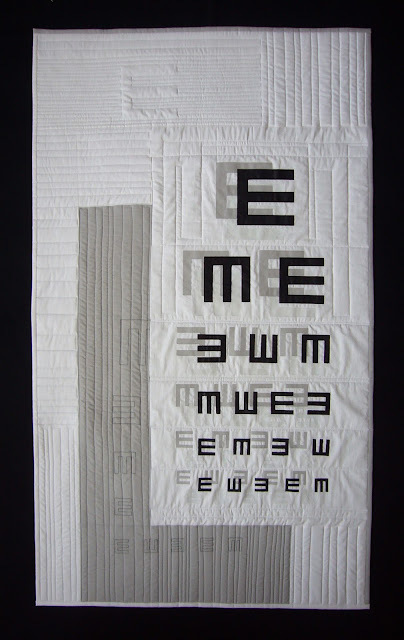 The reflections of the eye chart are made by appliquéd fused fabrics and ironed painted transfer paper. Machine quilting with grey ombre and white threads. An amazing quilt festival in Birmingham captured all my senses. The exhibitions, sewing machines, tools, fabrics, workshops and meetings. I am truly satisfied. I am sure anyone has seen many pictures from exhibition. Have you heard - the dates were announced - from the 9th-12th August 2018 . Floating and airy design, congratulations! Is there a way to meet you in Sofia at this moment?